The Cavalier King Charles Spaniel has a long coat that is wavy, but not curly. There is a silky texture to the hair with a lot of feathering in the coat. 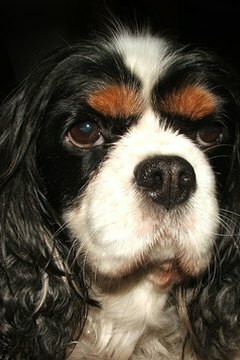 The Cavalier King Charles Spaniel is a popular breed of dog that is often entered in dog shows. According to k9web.com, the Cavalier King Charles Spaniel that competes in shows should not have his hair clipped or trimmed prior to a show because it is against show rules. However, for practical reasons, the average owner of a pet Cavalier King Charles Spaniel may wish to give regular haircuts to avoid tangling and matting of the dog's coat. Before attempting to give your Cavalier King Charles Spaniel a haircut, it is important to remove all of the tangles and knots in the coat. You may accomplish this task by brushing the dog all over with a slicker comb, which is a metal comb with a wooden handle that has about 40 teeth. This type of comb helps remove dirt from the coat without pulling the dog's hair. If the tangles are persistent, use a detangling solution. Many owners of Cavalier King Charles Spaniels prefer to thin the coat rather than cut it. You can thin the dog's coat by using special thinning scissors and thin with the growth of the coat in a downward motion. When finished, comb the coat and determine if any additional thinning of the coat is necessary. Repeat thinning and combing until you achieve the desired results. The feet of the Cavalier King Charles Spaniel may be trimmed of feathering (long hair on the back of legs, just above the feet). Many owners of this breed of dog prefer the feet to be trimmed, so the hair does not drag the ground. The hair between the footpads must be cleaned out with scissors on a regular basis.